56 per cent people depend on agriculture, says Vice-President Venkaiah Naidu. Mumbai: Terming farm loan waiver and free power supply as mere "temporary and populist" steps, Vice-President Venkaiah Naidu on Thursday made a pitch for long-term solutions like infrastructure support and cheap credit to improve the agriculture sector. Delivering the Laxmanrao Inamdar Memorial Lecture here, Naidu also called for suitable changes in the laws governing the cooperative sector in view of changed techno-economic and business scenarios to make the cooperative institutions "viable and vibrant". "There are many challenges in the agriculture sector. You cannot have temporary solutions to agriculture. Loan waiver, free current ... they are temporary," he said. "What is needed is remunerative price, infrastructure support for agriculture and cheap credits. 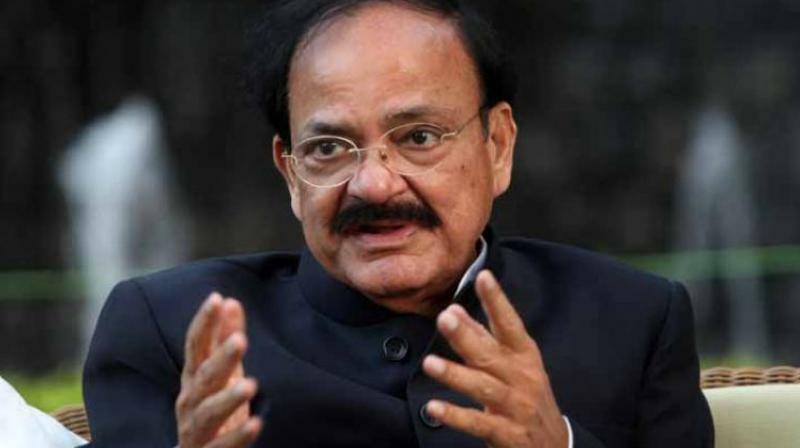 Unfortunately for political reasons, we move to populistic, temporary measures," Naidu said adding that the governments should rather focus on long-term solutions. "You cannot reverse urbanisation, even if you want to ... Even today, 56 per cent people depend on agriculture. "The best method of (improving) agriculture according to me is the strengthening of the cooperative movement. This has to be understood by all including the planners, NITI Aayog, political parties, Parliament, people and media," he said. "The prime minister promised to double farmers' income by 2022. This is a noble idea, but it is not simple. The government has raised the MSP of most of the crops. Cooperatives can help small and marginal farmers in taking the benefits of higher MSPs," he said. Terming India's cooperative movement as the "biggest" in the world, he said it has led to tremendous progress in several sectors of the Indian economy. "I am told 75 per cent of rural households have been covered through a network of over 8.50 lakh cooperatives with a membership of well over 25 crore," he said. "Mounting dues in cooperative credit institutions, inadequate mobilisation of own resources, over-dependence on governmental and institutional support, lack of professional management have proved harmful to their growth. There have been instances of mismanagement and absence of monitoring," he said. "Probably, the time has come to bring requisite changes in the relevant laws governing the cooperative sector in the context of changed techno-economic and business scenario to make the cooperatives viable and vibrant enterprises," the vice president said.